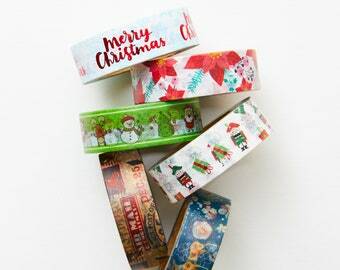 We sell washi tapes and other decorative tapes. Announcement !!! Black Friday Deals !!! Sales start on 11/19 and end on 11/25. !!! Black Friday Deals !!! Wonderful! A delight to deal with! Thanks! Cute polar bear washi tape set!! 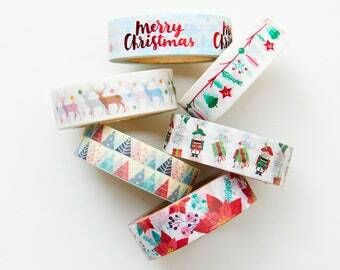 Beautiful Christmas washi tape set. Hurry up while stocks last. It is $15.95!! Wide selections of washi tapes!! Welcome to Love My Tapes where you will find a nice selection of washi tape, lace tapes, and fabric tapes. If you are looking for something specific or if you have any questions please send me a convo! I want you to be happy with your purchase but if your item arrives and is damaged or not to your satisfaction please contact me immediately so that I can work with you to resolve whatever issue it may be. If your item arrives damaged please also provide a photograph. Depending on the circumstance I may either refund or replace your item. Please note that I may request the item be returned back to me before any refunds are given, and the refund will be the item amount minus the shipping. Payment is expected in full before your order will be shipped. I participate with Etsy direct check-out and with paypal so ALL major credit cards are accepted as are Etsy gift cards. I’m sorry but I do not accept personal checks or money orders. All items are shipped via USPS first class mail and items are typically shipped within 3-5 business days. Once your item has been shipped you will receive an e-mail with a confirmation number so that you may track your package. If you need faster delivery please purchase available shipping upgrades when you check-out. For international customers, I am willing to ship anywhere, but please make sure you understand your countries specific policies regarding taxes and fees as you are responsible for those. LOST PACKAGES: Lost package from shipment cannot be refunded or replaced. Once the items goes to the hands of USPS, it is between the buyer and USPS. If you have any other questions regarding my product or my shop please feel free to send me a convo! I will do my best to answer all convos as soon as possible, but please give me up to 24 hrs to respond. My hope is that you will be pleased with whatever you purchase from my shop and I will do everything possible to ensure you have a pleasant shopping experience.